Now that the two Wildlife Detection Systems on Highway 3 have been operating for about three months (as of July 2016), we thought you’d be interested is seeing some of the thermal camera footage we’ve captured showing the system safely guiding interactions between vehicles and animals. How do these thermal cameras work? They create images based on heat radiating from animals and objects such as vehicles. There are nine thermal cameras set up in each wildlife detection corridor, and they work in conjunction with radar sensors to detect wildlife and alert drivers of their presence with flashing roadside signs. The two detection systems cover about nine kilometres of Highway 3 where large populations of animals tend to roam. The first video (above) shows a herd of elk in the wildlife detection corridor near Sparwood. Watch as lackadaisical elks wander in front of two commercial trucks. Good thing the drivers were alerted of the elk and had slowed down considerably before approaching the animals. Now, in this next video, we see a cougar casually hanging out in the wildlife detection corridor near Elko. The cougar actually sits in the middle of the highway for more than three minutes (the video is sped up), plenty of time for an unsuspecting driver to collide at normal highway speed. Imagine what could have happened if the truck driver hadn’t been warned of wildlife in the area and slowed down. On that note, drivers have been asking us why they sometimes don’t see wildlife when the warning signs are flashing. There’s more than one possible explanation for this, depending on the instance, and the cougar video demonstrates a good one: the warning lights remain flashing for several minutes after detecting an animal, so the truck driver would have been alerted of wildlife in the area, but wouldn’t have seen the cougar. 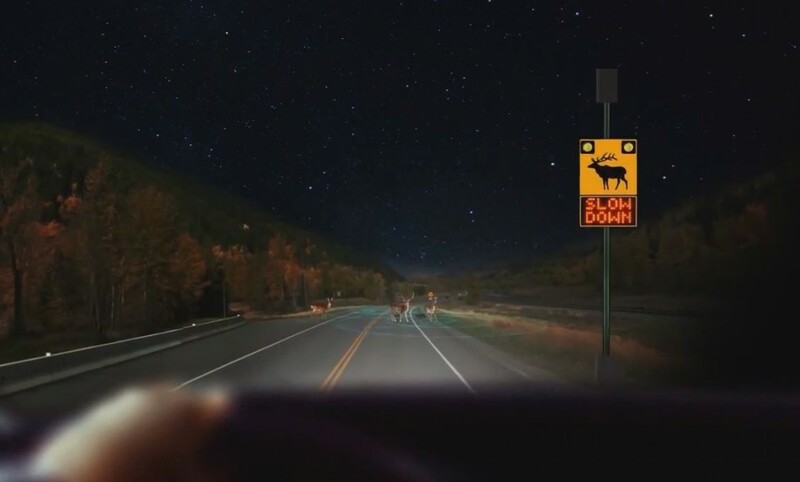 So, if you see a warning sign flashing without any evidence of actual wildlife on or near the highway, it doesn’t mean the detection system is misfiring. The animals could have simply left the road; or, they are behind you – you see, the whole corridor flashes regardless of exactly where animals are detected. Have you driven through one of these wildlife detection corridors? What are your thoughts on using technology to prevent collisions in this way? Hello. I live beside TCH #1 and there are many elk, deer, coyotes, and bears hit in my stretch of 5 kilometers. It is so common that they may not be reporting these incidents to the WARS system. Can I get some contact info to make sure my area is on the list of potential future sites? Sure thing Sherry – thanks for letting us know of your concern. Please connect with Leonard.Sielecki@gov.bc.ca regarding your location and concerns. He should be able to confirm if these animals are being included in the WARS system and let you know if there is anything further that can be done. Thanks again for connecting with us here and sharing your concern. Had a failure about 4 PM November 18. Sheep blocking a lane but no lights flashing. Herd was the same place about 12:30 and the lights were flashing then. My message may be coming to you via Mainroads Maintenance. We have shared your comment with the project team for review. Our System Integrator has reviewed our wildlife detection system’s log and found that the system was online, but in this case the sheep on the road were partially obscured by and incorrectly identified as stopped or slow moving vehicles. We have since made adjustments to the detection system to increase its reliability and better detect animals in this situation. Once again thanks you for bringing this to our attention. This is a great example of how technology can be used to limit injury and death for both wildlife and drivers. Well done. Watching those videos was incredible. What a wonderful idea!!!!! Glad you like it Phyllis! The greatest thing ever! We travel this section and I like this very much. If you have ever seen what a collision between an animal and a vehicle looks like you would like to se more of these installed! I think that’s a great idea & then one is slowed down & watching; hope the semis gear down so they are prepared to stop when these signs are flashing also as critters move strangely at night for sure. Thanks for the info on how it works. When do you anticipate having enough info to analyze their effectiveness? We have sent your question forward to the project manager and will let you know when we hear back. Thanks! We spoke with the Wildlife Detection System team to find an answer to your question and they told us that they will be collecting data for at least a year on a number of fronts to determine the effectiveness of the system. 1. Amount of time each day that the signs are on. 2. Average speeds of vehicles when the signs are on, and when they are off. 3. Direction of vehicles and sign activation. The ministry also collects data on animal-vehicle collisions through our Wildlife Accident Reporting System (WARS) and we will be reviewing and comparing the results of this year’s data to previous years in order to determine the effectiveness of the Wildlife Detection Systems. Prior to this system being installed we looked at 10 years of WARS data. We hope that this answer satisfies your question. If you have any other questions, don’t hesitate to let us know. Thank you and safe travels. Love them! Makes me and my family feel grateful for the warning.